One common thing on Twitter is to share whatever music, podcast, etc. you’re currently listening to, usually using the “#NowPlaying” hash tag. I was looking for an easy way to do this, and so decided to write an app. 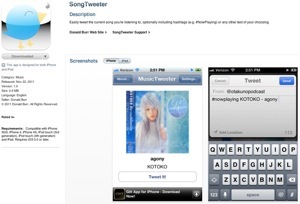 This app is small, and it does only one thing: lets you tweet whatever song/podcast/etc. you’re currently listening to. You can optionally add any text of your choice (e.g. the aforementioned #nowplaying hashtag) before and/or after the song title; and you can even optionally include album artwork. Go download it for free in the App Store today! It’s compatible with any iOS device running iOS 5 or later, and is a Universal Binary (works natively on both iPhone/iPod touch and iPad).